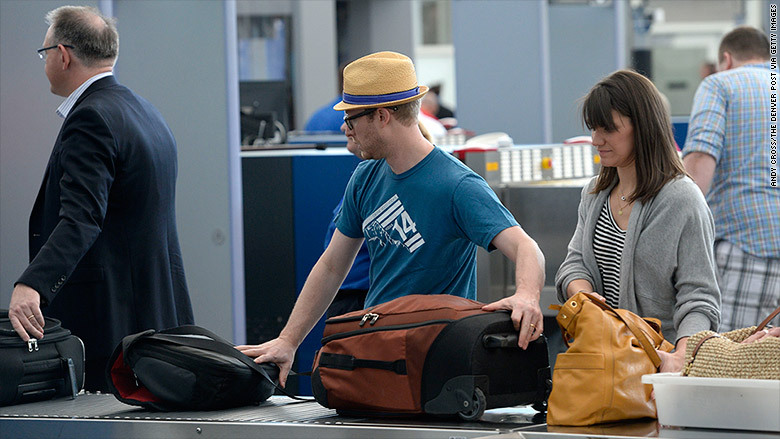 Will dropping checked bag fees solve airport security gridlockk? Will dropping checked bag fees solve airport security gridlock? Two lawmakers are calling on airlines to temporarily eliminate checked baggage fees to help relieve congestion at airport security lines. Democratic Senators Richard Blumenthal from Connecticut and Edward Markey from Massachusetts sent a letter Tuesday to airline executives asking them to stop charging bag fees during the busy summer travel season. Wait times at airport security have grown substantially in recent months as more travelers hit the skies. At some airports, passengers are complaining of wait times of at least an hour. And the problem is only expected to get worse this summer. The senators claim the baggage fees are contributing to the problem, and that cutting them will help alleviate some of the long lines. The letter noted that there's been a 27% increase in roller-bag carry-ons at checkpoints for carriers that have baggage fees compared to those that don't charge extra. "Without charges for checking their bags, passengers will be far less likely to carry them on, which snarls screening checkpoints and slows the inspection process," the letter said. But the airlines aren't buying it. For one thing, checked-bag fees are nothing new. They've been around since 2008. And given that they've become a big source of revenue, the airlines claim that getting rid of them would cause ticket prices to go up. "This is a misguided attempt to re-regulate an industry that has been de-regulated for the benefit of consumers," said Jean Medina, a spokesperson for Airlines for America, an airline industry group. "It would also have the unintended consequence of making airfare more expensive." And Southwest (LUV), which doesn't charge extra for checked bags (and wasn't sent the letter), is also feeling the effect of "unacceptable security checkpoint wait times." "The industry-wide issue has negatively impacted our customer experience at several key Southwest airports, including Chicago Midway, our largest operation," a spokesperson said via email to CNNMoney. The TSA announced last week that it plans to add more security officers and dogs to some of the country's busiest airports. The agency has also noted that screening lanes are already working at full capacity at many airports, so additional workers wouldn't necessarily reduce wait times. The letter, which was sent to a dozen airline companies, including American Airlines, Delta (DAL), United (UAL), Spirit (SAVE), Virgin America (VA)and JetBlue (JBLU), acknowledged that a temporary fee freeze is "not a panacea." Long security lines have led to missed flights, creating problems for fliers and airlines. During a busy spring break week in March, 6,800 American Airlines (AAL) passengers missed their flights because they were stuck in a security line, according to Ross Feinstein, a spokesman for American. "The concern is that in the summer, every week is spring break." Many flights are fully booked during the summer months, which can make re-booking tough. Some airports have even told the TSA they would consider hiring private screeners to help reduce the long lines.